DrumBurp’s comes pre-loaded with a number of default drum kits that you can use to write your scores. 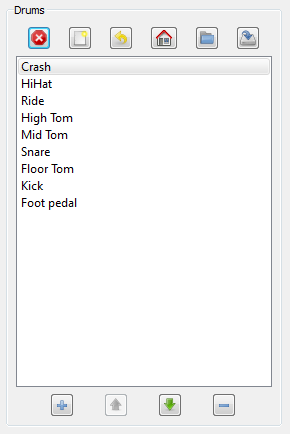 You can also add your own drum kits to the list of defaults rather than manually loading & saving them. Default – The DrumBurp default kit, applied to all new scores. Classic – A minimalist kit. Ttabs.com – Drums and abbreviations as used by the ttabs.com tab sharing website. MvK – Another drum tab style used by ttabs.com. Drumtabber.com – Drums used by the drumtabber.com tab playback website. 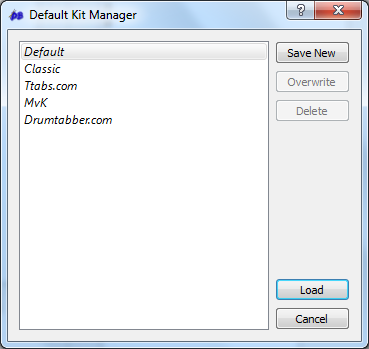 To load a default kit into the kit editor just select it and press the Load button. To exit without loading a default kit, press Cancel. If you frequently use your own drum kit settings, it might be useful for you to have them easily available. To save the current kit (as defined in the kit editor) into the default kit list press the Save New button. To overwrite a user-defined default kit, select it and press Overwrite. User-defined default kits can be deleted by selecting them and pressing the Delete button.